Spring 1 - Out of this World! 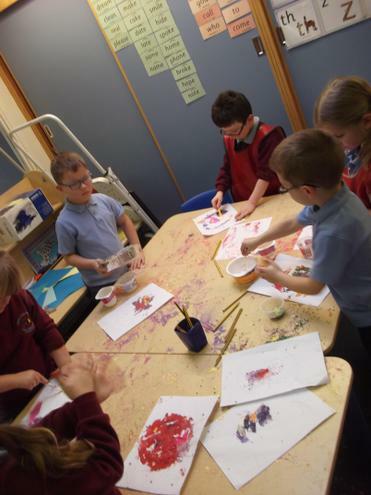 We have had an exciting week this week. 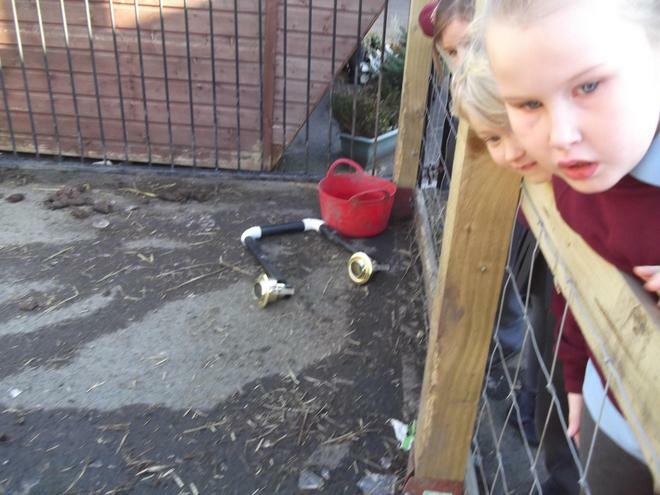 We discovered some peculiar looking objects in Wilbur's pen. 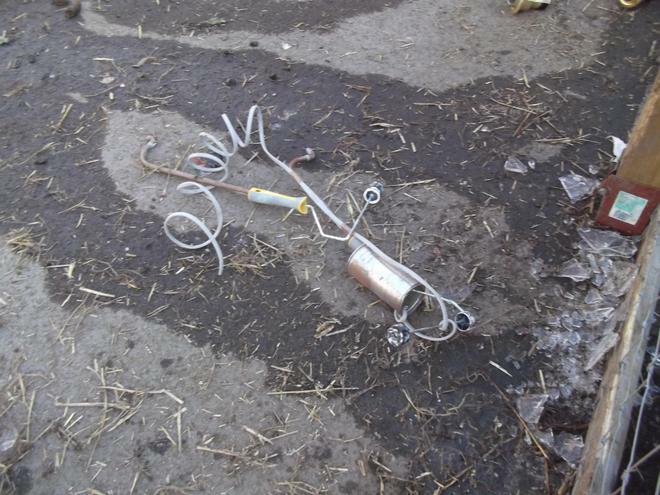 At closer inspection we saw that they looked like parts of a rocket and an animal space suit. 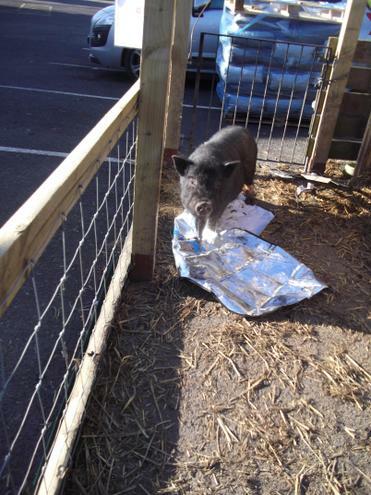 Then we got a message from Wilbur explaining that he had been going into space at night. He had seen all sorts in space and he asked us to write a postcard to Mrs Richardson as he couldn't hold a pencil. 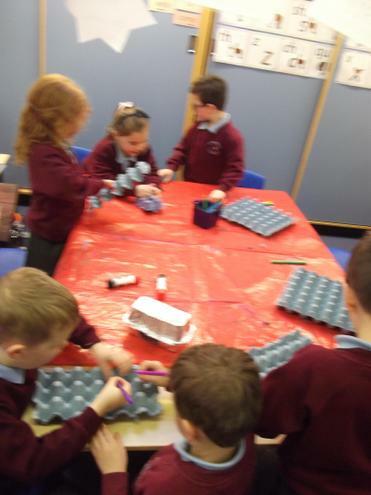 We have also been using construction to make the International Space Station. 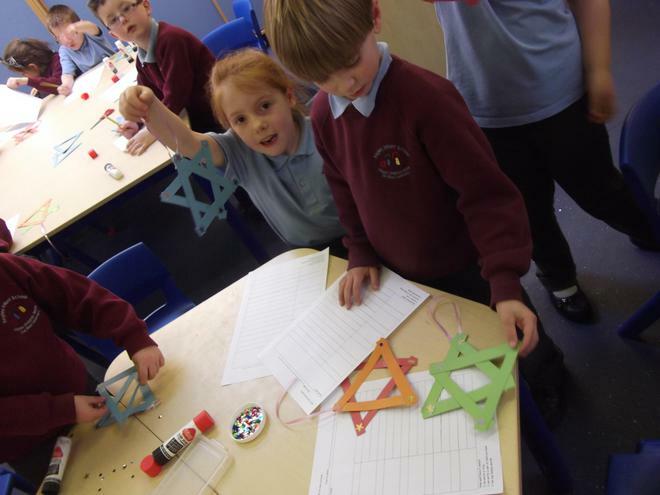 We had to follow instructions to make our own star. 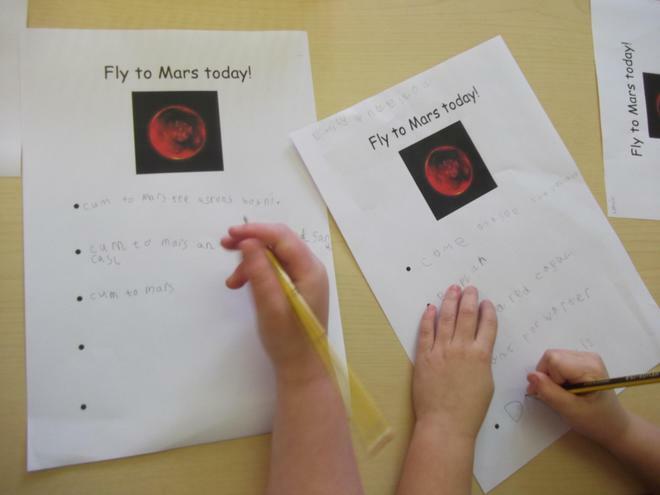 In Literacy we have been writing facts about space. 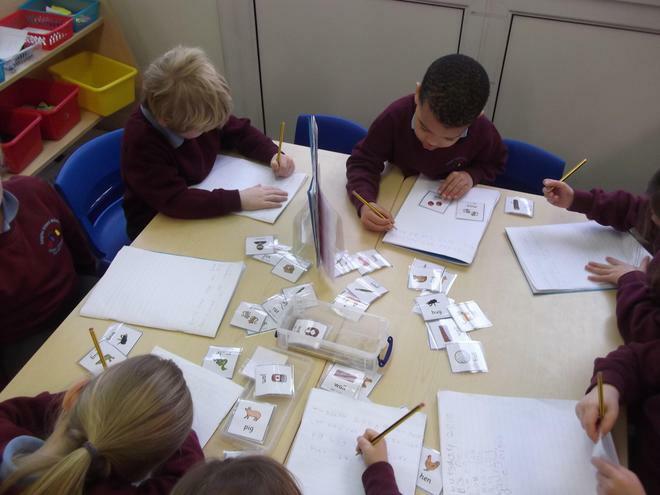 We have been practising writing perfect sentences that include a capital letter, finger spaces and a full stop, as well as remembering to use our letter sounds. Please can we practise this at home? In Numeracy we have been adding and subtracting using a number line. Let us show you how to use a number line. We have to jump forwards to add and jump backwards to take away. 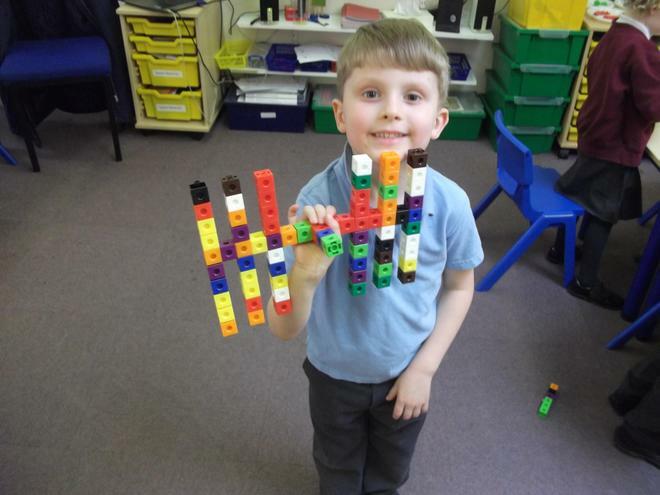 We have also been finding different ways to make a number. For example, Mrs Marshall gave us the answer 10 and we had to find the different numbers we add together to make that number (e.g. 8 + 2). 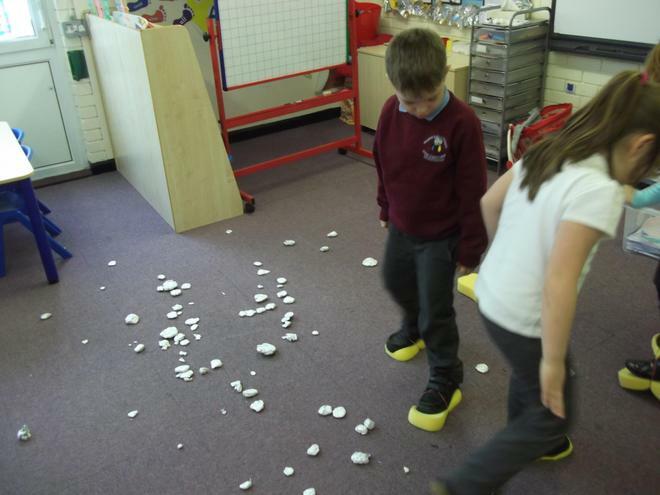 Some of could even subtract numbers to make 10 (e.g. 15 - 5) . Give us a number and we will try to find the different number to make it. In Literacy we have been writing our own space poems. Our teachers have really enjoyed reading them. 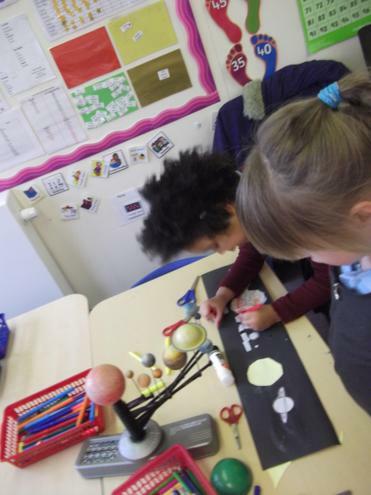 We have also been writing descriptions about the planets. 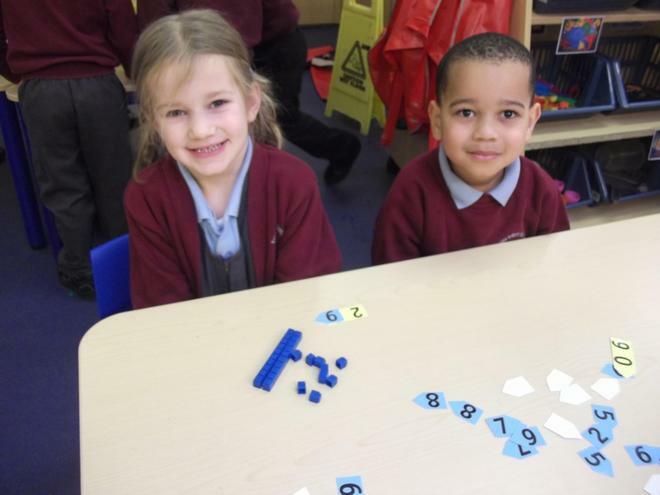 In Numeracy we have been finding the missing number in number sentences. 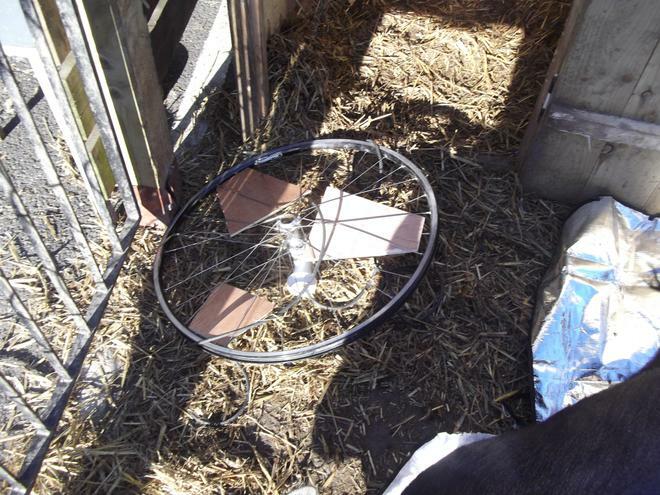 It has been quite tricky. Can we practise at home? 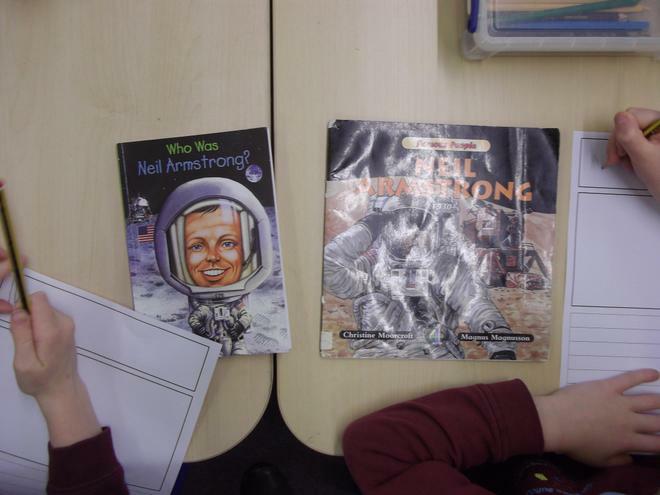 In Topic we have been researching Neil Armstrong, the first man on the moon. 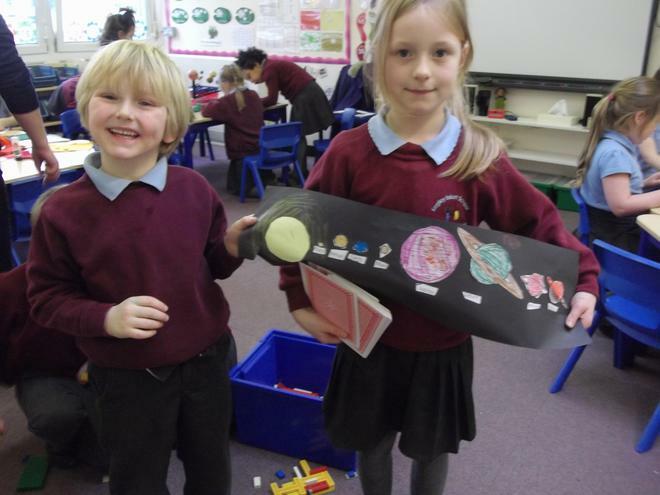 We have found out about the animals Laika, Able and Baker the animals who went into space.Why not find out some more facts about the people, or animals, that have travelled into space. We wrote an advert for travelling to Mars. 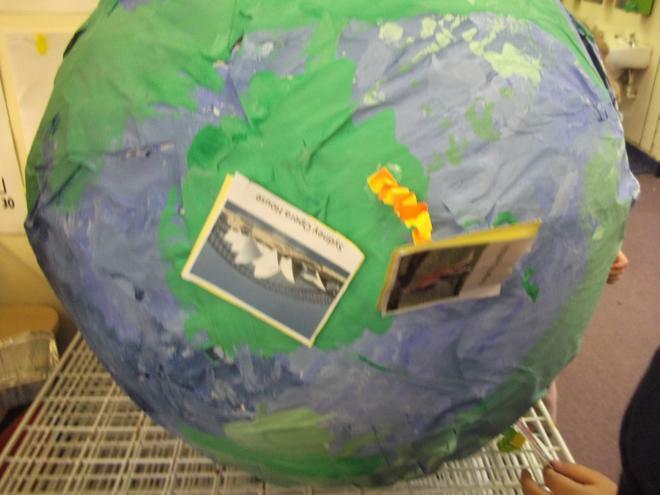 We worked together as a team to make a model of the earth. 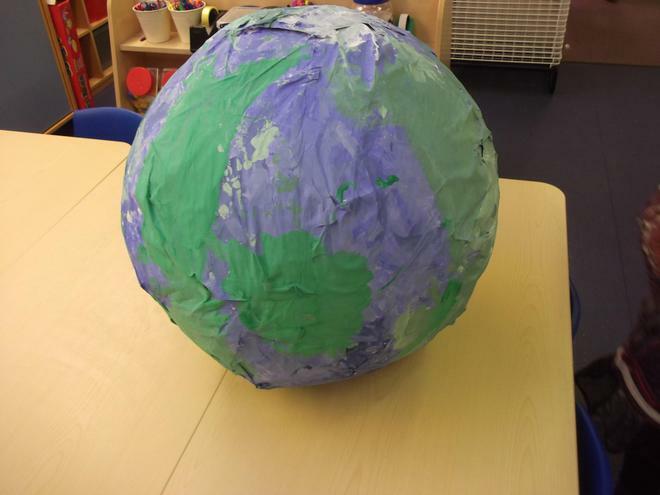 We covered a gigantic ball in paper. 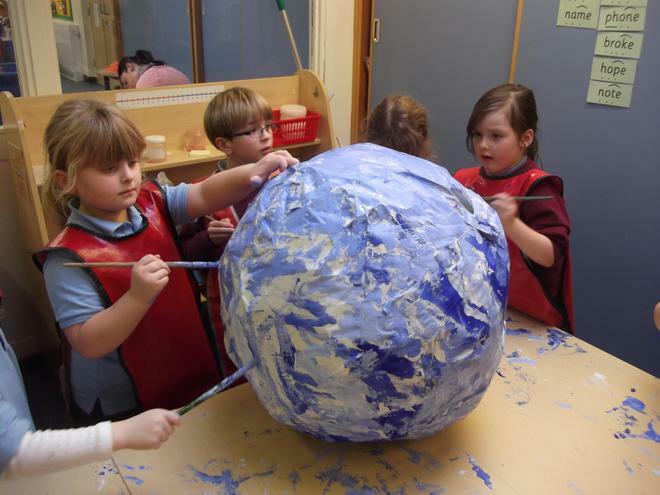 We used blue and white paint for the oceans. We found out that Earth is made of mainly water. 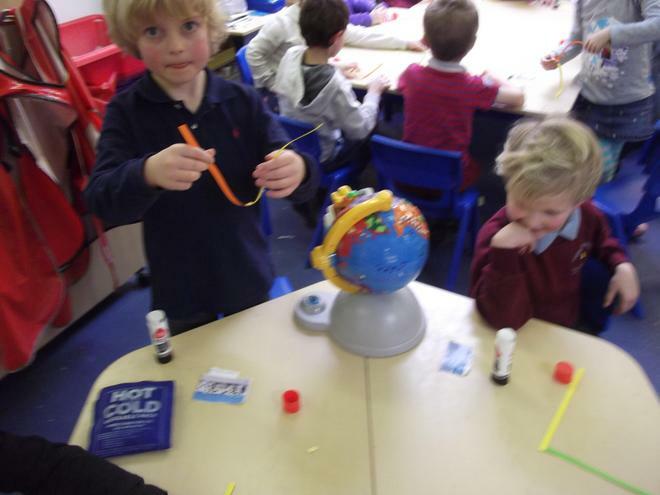 We had to look closely at our globe so we could paint the countries in the correct place! 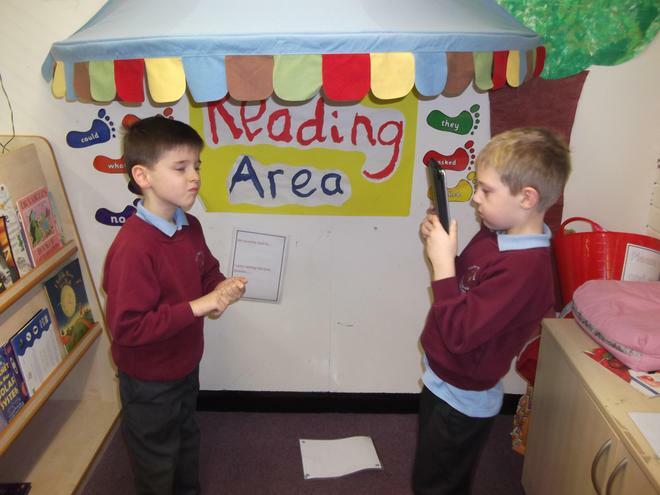 In Literacy we have been reading and learning poems off by heart. 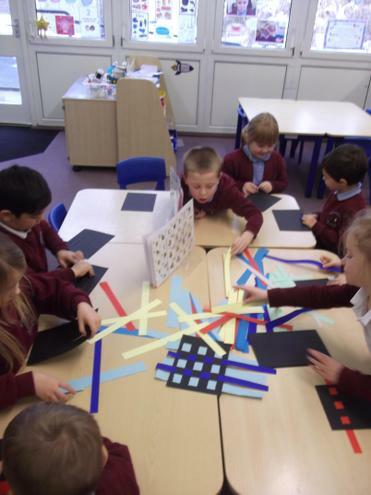 We really enjoyed learning 'Star Light'. We have been matching rhyming words and looking at alliteration. In Numeracy we have been finding half. 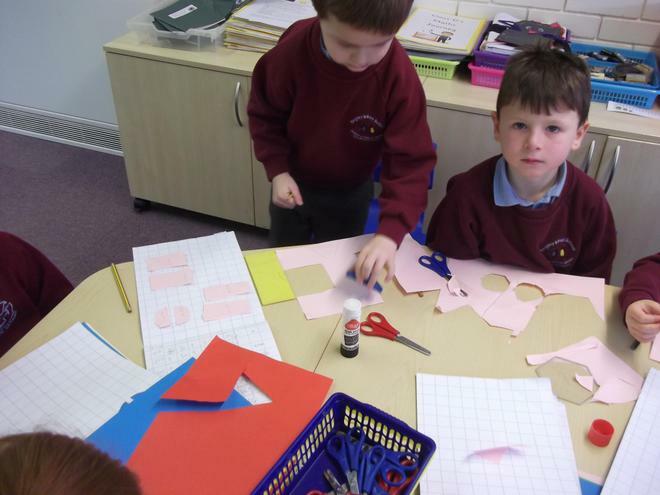 We have found out how to find half of a shape. 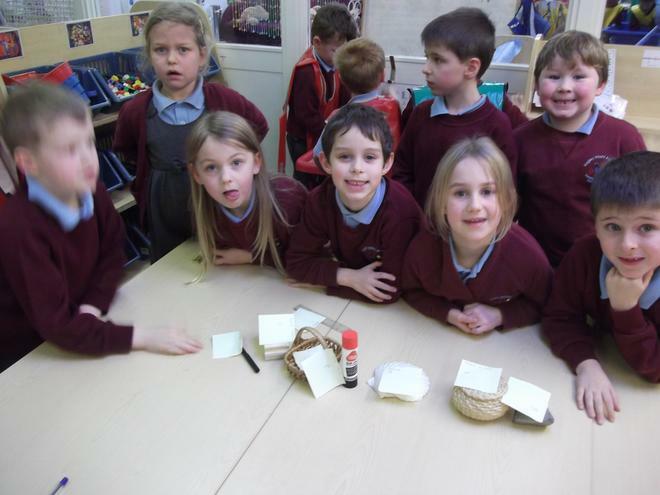 We have been finding half of a group of objects by sharing between 2. Can you find us things to halve at home? 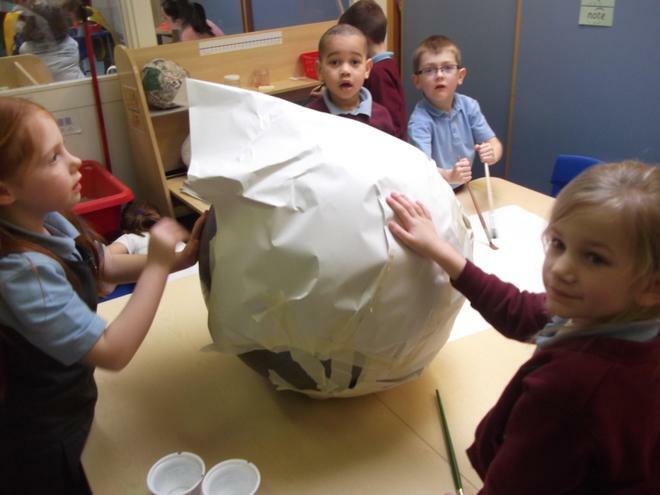 Making papier mache balloons ready to create the planets next week. 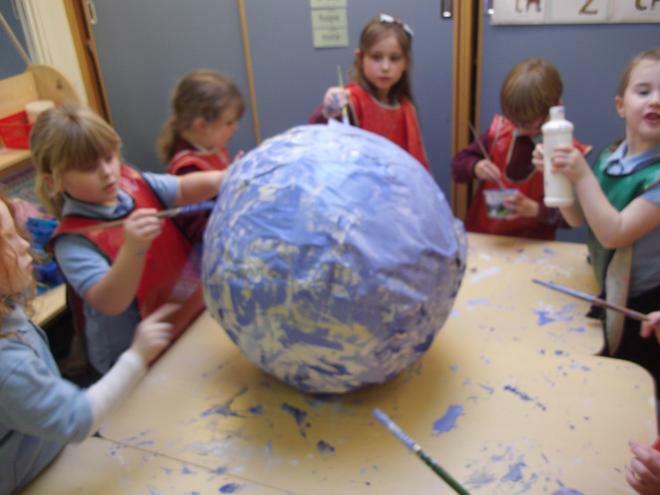 Using different textures to create the surfaces of the planets. Watching a clip about the surface of the moon. 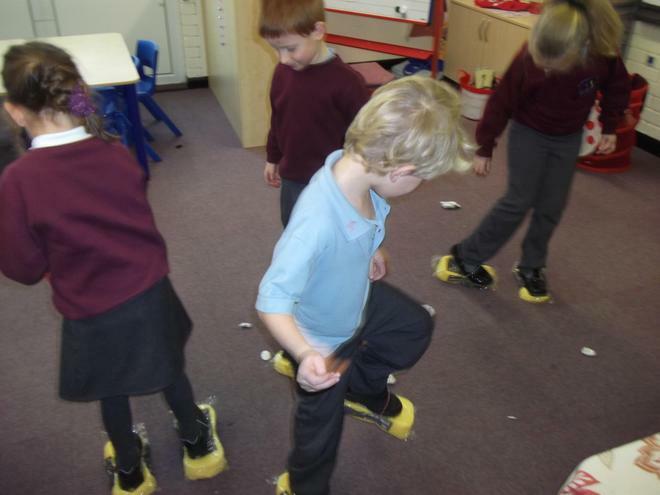 We used car sponges to create the feeling of walking on the moon. It was quite tricky! 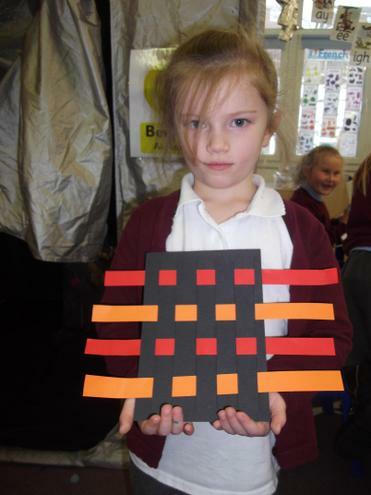 We have been weaving using hot or cold colours. 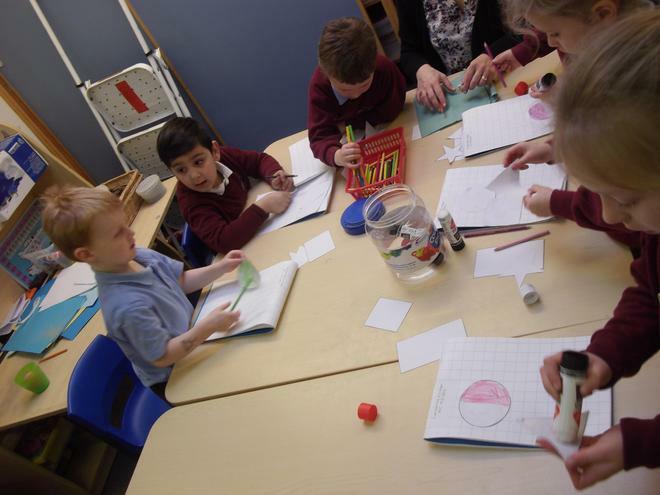 In Literacy we have been writing postcards from the moon. 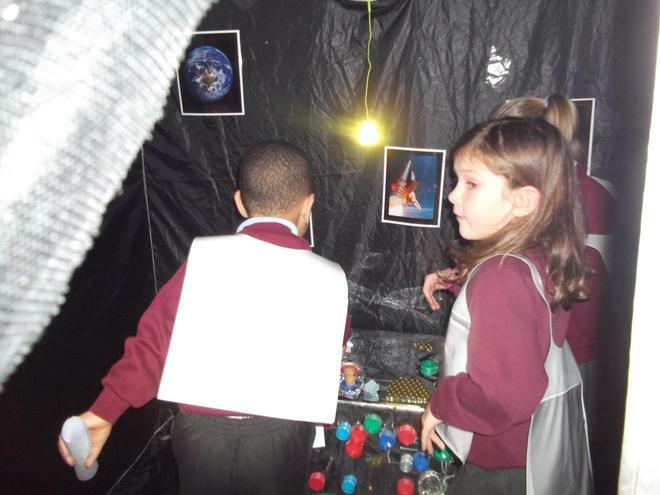 We have enjoyed the opening of our space station. 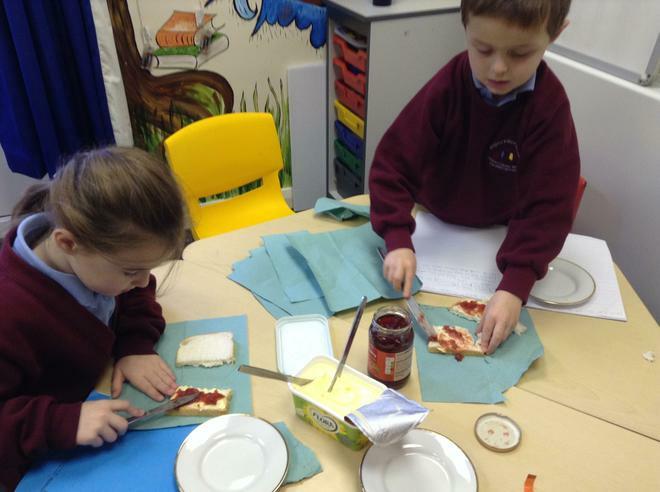 Some of us have written our own instructions on 'How to make jam sandwiches.' 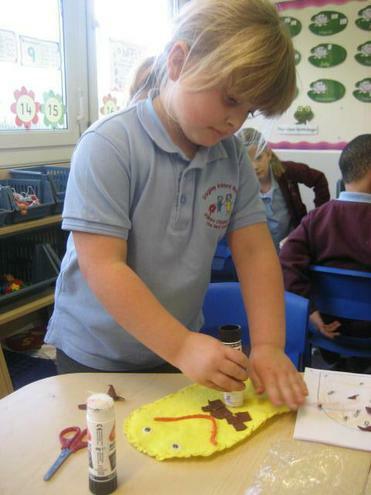 We then got to follow our instructions. The sandwiches were yummy! 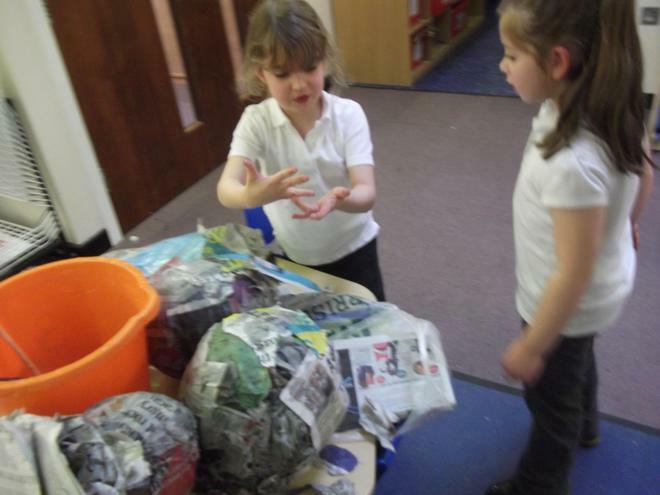 In Numeracy we have been weighing objects and putting them in order from the lightest to the heaviest. 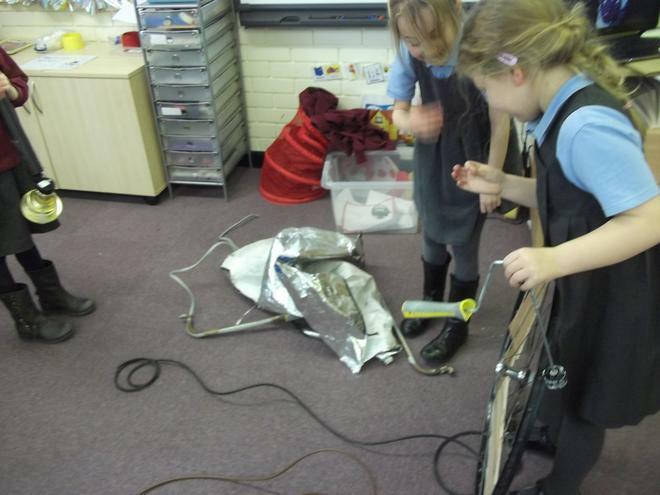 Can we weigh things at home? 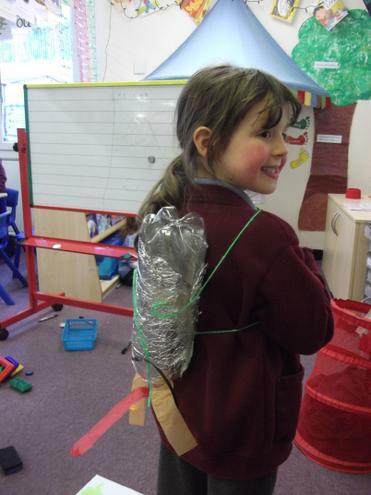 In topic we have been making our own jet packs. 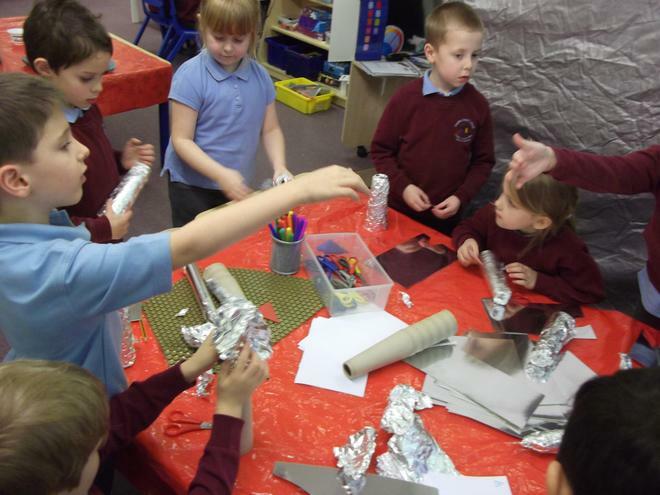 We watched videos on 'youtube' of how astronauts eat in the International Space Station. 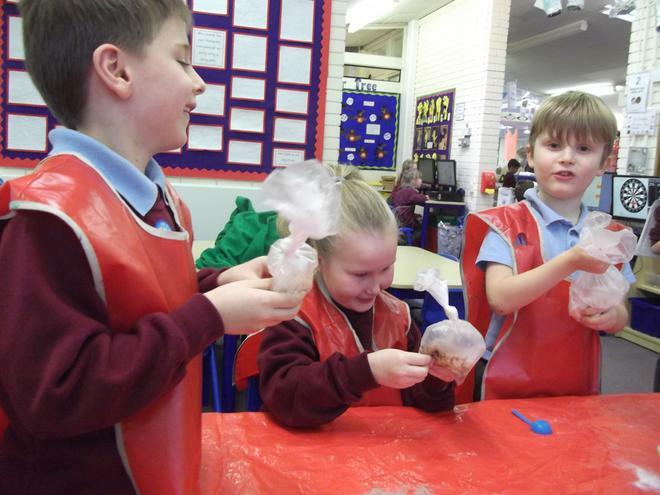 Then we followed instructions to make our own astronaut pudding. How to make astronaut pudding. 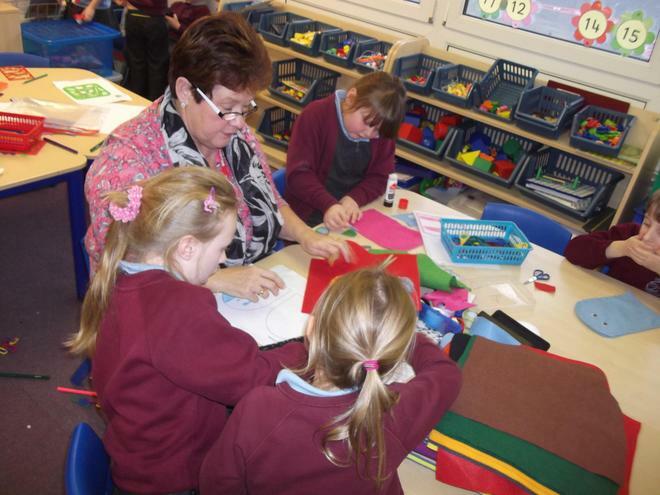 As part of 'World of Work Week' we have designed and started to make our own puppets. We will be selling our puppets for £2 to raise money for Year 1. If you would like to buy our puppet please send £2 in a named envelope.We decide as a year group what we would like to spend our money on. Put 2 heaped teaspoons of dry pudding mix into a small plastic bag. Add 1 teaspoon of powdered milk to your bag. Mix it up. Pour in 6-8 teaspoons of water and seal the bag. Double check that the bag is sealed, and then squish, squeeze, and mix the pudding until it’s all blended and starts to set. Cut the corner off of the bag and squeeze it into your mouth, astronaut-style. We have all enjoyed our first week back. We have been so busy! 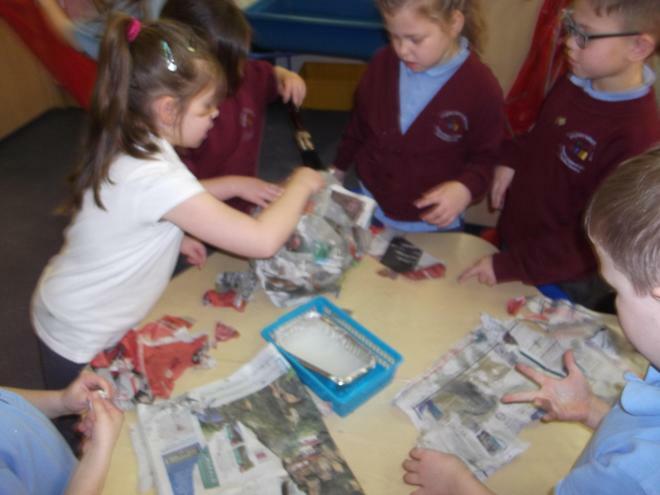 In Literacy we had a big task to complete. Mrs Marshall's friend Bob needed some help. He sent us a video telling us that he had a new job as the cleaner on the moon. Bob asked us to find out what clothes he would need to wear, what he would need to pack in his suitcase and what cleaning equipment he would need. At the end of the week we had found out what he needed for his new job and Lucas and Will sent a video explaining everything to Bob. We then recieved a parcel and another video message. It was Bob thanking us and explaining that he had sent us a package. The package was a book all about him and his job on the moon! 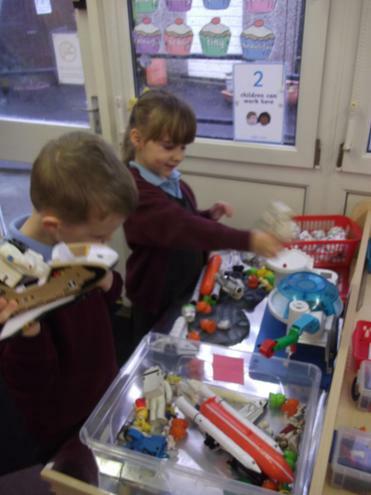 We have been enjoying the space small world. 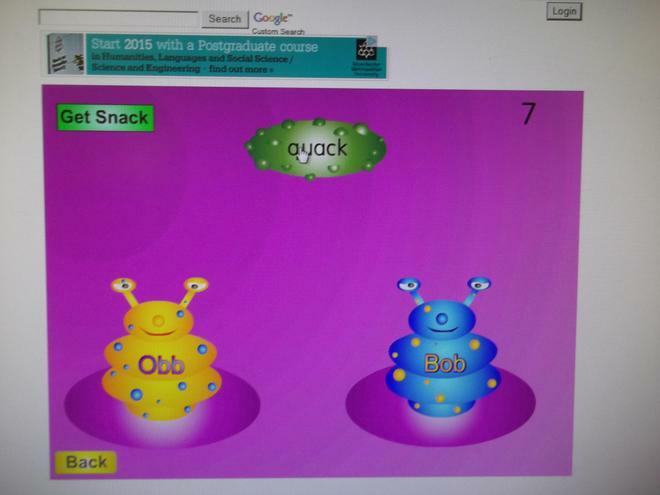 We have used the website www.phonicsplay.co.uk to sort real and fake words using our letter sounds. We can use this website at home. 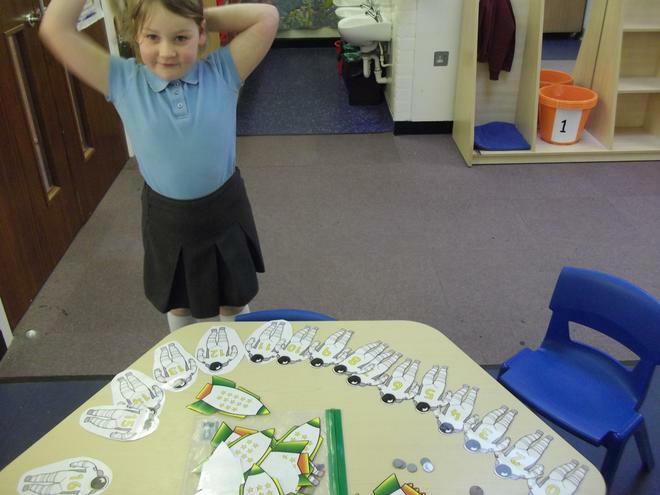 In Numeracy we have been ordering numbers, some of us numbers up to 100! 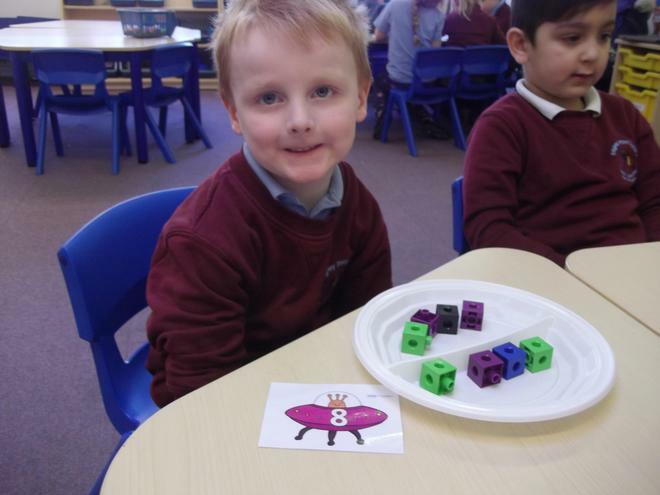 Give us 3 or 4 numbers and see if we can order then from the smallest number to the biggest number. We have been finding out the value of 2 digit numbers. 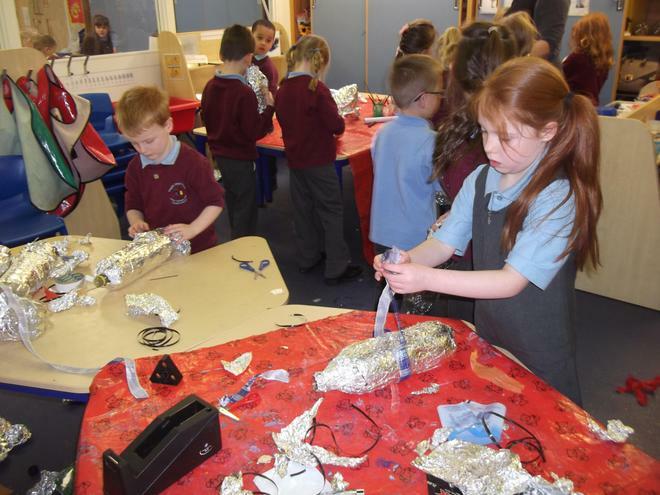 Working as a team creating spacesuits for astronauts. 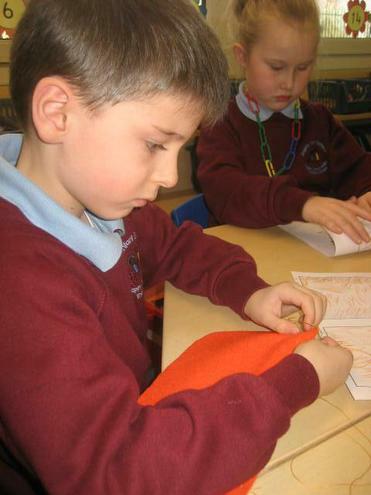 We used information books to find out what the spacesuits needed. 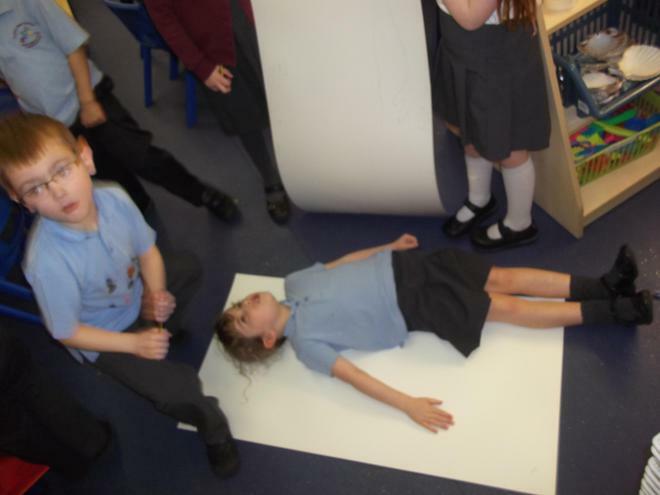 Finding out about sources of light. 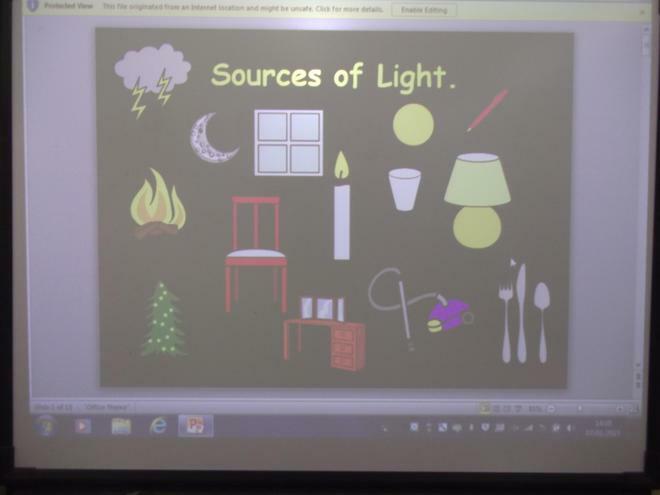 What sources of light do you have at home? 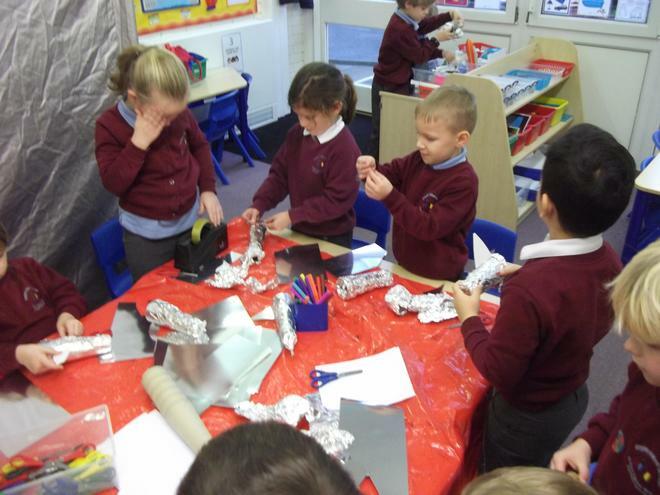 Using junk materials to make our own space rocket.